Now that I have all the Ironman results from the last few years in my database, I am able to have a look at the impact of the KPR and how some changes would influence the list of qualified athletes. If you have some more questions that I can look into, please drop me an email or let me know in the comments. I’ve got at least one more question I want to look into, but I’m saving that for another post. However, I think these two are sensible choices for a two year qualifying cycle. First, a little disclaimer: As I don’t have all the 70.3 results in my database, I just used the 2011 results. Therefore, my calculations are not 100% accurate – but they should give us a good indication of how things chance. Some of these were injured and couldn’t rack up enough points in 2011 (Neyedli, Bayliss, Kessler) and some ended their career (Widmann?). Hillary Biscay just had some more races that she could score at, which helped her get decent points races count toward the five races. All in all, from a points perspective nothing much would have changed. But there is still some more room for speculation: What influence would the “relaxed” requirement of “one IM outside of Hawaii in two years” (instead of one year) have had? I think this last point is the only one that leads to a potential improvement for the Kona field: Lower the requirements for past Kona champions to get back into the race. While it is understandable that WTC wants to have everyone qualify by racing in an IM during the year, the addition of a past winner could change the dynamics of the race. I would propose something like a one or two year automatic spot for the winner of a race or lower the requirement to “just” a 70.3 race. One more question that I have seen discussed is weather results from 70.3 races should be included in the Kona points. Both “fields” are pretty close to one another, but if I had to choose between the two, I’d probably choose those that made it in with their 70.3 points. However, this is not a sign that the KPR is “good” at choosing the “right” athletes – it is more a consequence of people knowing that they could get enough points in 70.3 races and planned their season accordingly. 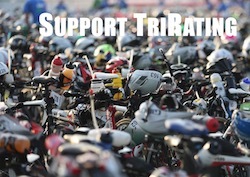 From a business standpoint, WTC’s decision to count 70.3 points toward Kona is helping the 70.3 races. If they didn’t do this, the 70.3 series would have been seriously impacted by the requirement to race at least one Ironman race to validate a spot. Also, it favors the WTC core market (North America) which has a lot more 70.3 races than the rest of the world. Overall, I don’t see any pressing need to change the current scheme.